Maybe the Snake Wanted to Pose for a #Snelfie? 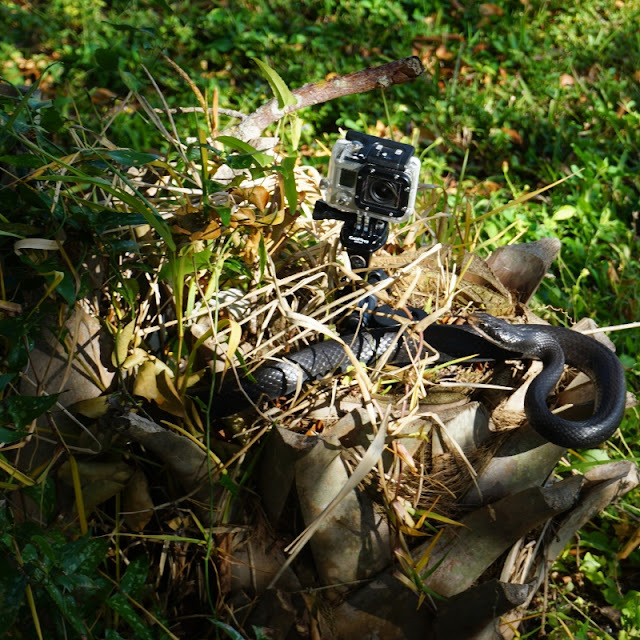 A snake cozies up to my GoPro after I set the camera down to take a selfie under a gumbo limbo tree at the Calusa Heritage Trail in Pineland, Fla., in December. I used my iPhone to film this quick video. The snake, a black racer, is not venomous, and it did not do any harm to me. Although I didn’t record it, the way I resolved my predicament was to take a long stick and knock my camera off the tree stump. I’m not sure if the snake was protecting eggs around the stump or if it thought the GoPro was another snake. Although my GoPro was recording, the snake never made it in the frame. Has this happened to you?